A new "teach-out" series from the University of Michigan focuses on creating discourse in today's shifting political climate. 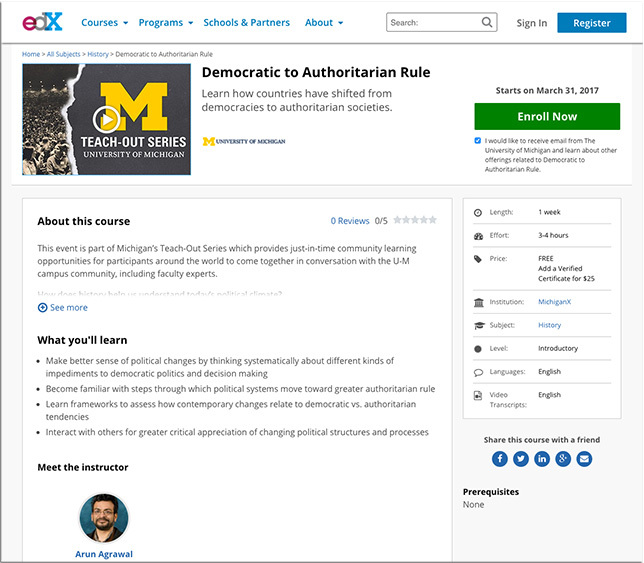 Offered on the edX platform, the free, weeklong learning events are modeled after the university's historic "teach-ins" of the mid-1960s. With those teach-ins, "Faculty who wanted to express concern about the U.S. government's role in the Vietnam war opted to use an educational event rather than a walkout to share their opposition," the university explained in a press release. "In much the same way, U-M's teach-out series will bring learners together around important, timely topics, including fake news, the Affordable Care Act and understanding science." Interact with others for greater critical appreciation of changing political structures and processes. Agrawal contrasts the teach-out with today's social media-driven culture, in which "facts" are disseminated in 140-character tweets, devoid of context. "What we're offering instead in the teach-out is a story, a narrative," he said in a statement. "It's a way of thinking about and connecting different facts so that they make sense. And I think there are many people who are hungry for this kind of engagement and thoughtful conversation." Future teach-out events include "Fake News, Facts, and Alternative Facts (April 21), "Reach Out and RELATE: Communicating and Understanding Scientific Research" (May 5) and "The Future of Obamacare: Repeal, Repair, or Replace?" (May 12). "University professors and university researchers, this is what they do. They work with students in the effort to educate, provide information, and to engage and inspire," said Agrawal. "And the teach-out is an expression of that goal and ambition that institutions of higher learning, universities and researchers stand for when they are at their best." For more information, visit the U-M site.